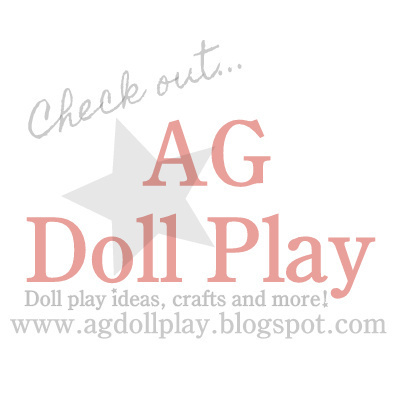 American Girl Doll Play: Fun with Friends! It has been so long since we have posted on the doll blog! We've tried to keep up with updates on the Facebook page but crazy times have made for some pretty long absences here in AG Doll Play world. Gracie and Lily (Amanda's girls) now have a new baby brother and in addition to my changing careers we also have made a (local) move into a house...that has a room solely dedicated to playing and DOLLS! Hooray! We will share pictures of how we set things up with you soon. But in today's post we wanted to share some pictures of our dolls in their new home...we had some time to play this afternoon and it felt so good! We had to share pictures of some of our friends with you. Ivy came in from a walk outdoors and joined in the conversation. She LOVES the new yard that they now have...it's pretty amazing I have to agree. They now have a real honest to goodness GARDEN!! So exciting! I had to take a close-up picture of Ivy's outfit today, she looked so cute and is so true to her own fun style! The girls chatted about all that they have accomplished with moving in these past few weeks...and how fun it was to have been in the Fourth of July parade this summer. They have been so busy! And now that they are getting a little older they are starting to get some babysitting jobs too which makes their schedules even more full. Zoey and Kristen can handle it though...they are so responsible and true to who they are...they make work and being responsible fun. It's so good to have friends like that! Hope your summer is going great! Can't wait to share more with you soon! Great pictures! Everyone looks like they are having fun. Love Ivy in the tutu.